DURING May this year , the Far East Clearance Diving Team had the very great and possibly unique privilege of carrying out a brief diving survey on H.M.S. Repulse. Approval for this operation was granted on the grounds that it would be good training value as well as being of unusual interest. Although Repulse is not officially designated as a War Grave it is regarded as such and stress was placed on the requirement that the ship was not to be entered and nothing was to be disturbed externally. This trust was faithfully observed. H.M.S. Repulse lies some 45 miles N.N.E. of the island of Pulau Tioman off the east coast of Malaya. Being so far from good navigational aids, the initial location of the wreck had to be carried out by a suitably equipped frigate. H.M.A.S. Yarra was the one chosen for the task. Her mission was successfully carried out and a datum dan buoy was laid some three days before diving operations were scheduled to begin. The location of this datum marker by H.M.S. Barfoil (acting as Diving Support Ship) and M.F.V. 164 (with the Diving Team embarked) was initially thwarted by rough seas and heavy rain and it was feared that the marker might have dragged well clear of the wreck or even have sunk. Fortunately H.M.S. Ajax was in the area on her way back from Hong Kong and was able to assist. She located the marker and confirmed that it was still close to the wreck. By this time daylight was fading and the first day's work had been lost. However, Barfoil had laid a very accurate heavy marker alongside Repulse and diving was able to commence the following morning; which was, happily, a calm and clear one after the previous day's storm. Of the 5 ½ days remaining one more was to be lost due to rough weather and, in the closing stages for no accountable reason, the tide changed its working pattern and ran more strongly, further hampering diving operations. Diving conditions, generally, were excellent. The water was very clear and, needless to say, warm. In fact, underwater visibility was so good that the silvery shape of Repulse could be seen from the surface of the sea through a face-mask, before the sun rose too high and veiled her with the increased reflection from the mass of particles in the water. 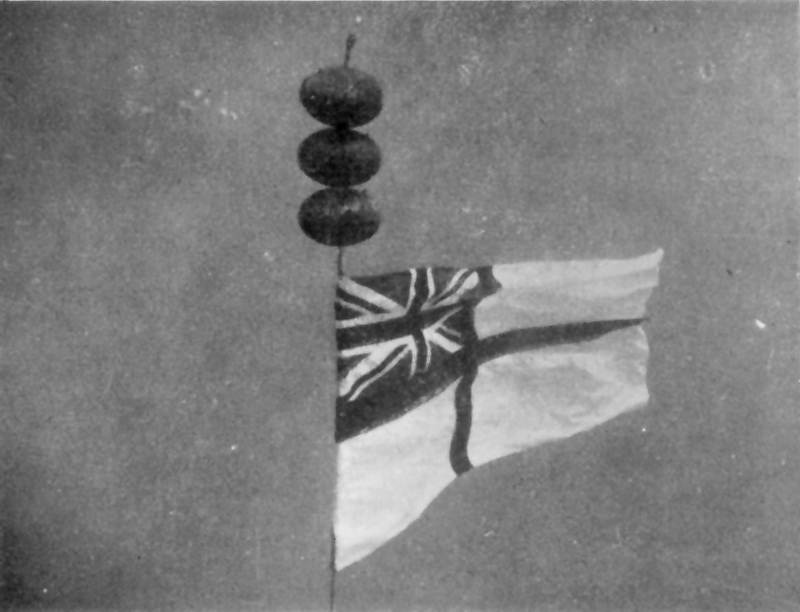 Those that claim to have seen Repulse from the air and to have clearly seen her mast are mistaken and have in fact seen the shadow area cast by the bulge keel. For this majestic and awe-inspiring ship lies on the sea-bed almost completely capsized to port with her starboard bilge keel uppermost and her decks under-hanging the horizontal by about 30 degrees. She lies in a mean depth of 180 feet with the stern in slightly deeper water of 196 feet, perhaps caused by a tidal scour created over the years by prevailing ocean currents. The bows lie in a heading of 196 degrees (true) which, were one to extend it on a map, ironically passes through Singapore from whence this magnificent ship set out on her ill-fated mission 24 years ago this December. The hull is in very good condition with remarkably little marine growth other than a scattering of sea eggs, a few anemones and small clams about 8 inches across. On the wooden decks, which are bleached white and have lost their caulking, hang a mass of oysters. Fish life abounds and the first customers normally seen on the way down were large shoals of barracuda, static and staring with those big beady eyes. Highly coloured angel fish and parrot fish were always present around the wreck and also, occasionally, larger and more fearsome inhabitants in the form of big grouper (or Jew fish) over 6 feet long, twice as broad as the average man, and having a viciously spiked long dorsal fin. These parochial creatures were given a wide berth, needless to say. The only sign of action damage was a large jagged hole some 20 feel aft of and slightly above the starboard bilge keel from which twisted pipes and machinery grotes­quely protruded. The theory put forward that the 15 inch turrets fell out when the ship capsized is certainly not so in the case of `Y' turret, which was seen to be properly in place and trained aft. It was our intention, had Repulse been upright and her mast intact, to replace her battle ensign prior to leaving the area. As this was not possible, a mast was made up of a 60 foot span of dan wire supported by three elliptical floats instead and this was `keel hauled' into position and secured to its own part round a propeller shaft. From this `mast' and immediately below it was sewn a six breadths White Ensign which was last seen proudly billowing out in the tide. NEARLY 25 years ago, on December 10th, 1941, H.M. Ships Repulse and Prince of Wales were sunk within an hour of each other by Japanese high level and torpedo bombers some 45 miles N.N.E. of the island of Pulau Tioman, off the East Coast of Malaya. Repulse was the first to sink at 1233 as a result of five torpedo and one bomb hits. The Prince of Wales followed at 1320 having sustained five or six torpedo hits (two port side aft, followed by three or four forward, midships and starboard side aft) and one bomb hit. Both ships heeled over and capsized to port on sinking, with the Repulse proceeding at approximately 15 knots, but the Prince of Wales reduced to less than 8 knots. The ships have come to rest with the Repulse lying in a depth of 180 feet and the Prince of Wales 8 miles away to eastward in a depth of 216 feet. In May 1965, the Far East Clearance Diving Team carried out a brief external survey of H.M.S. Repulse and an article on this diving operation was published in Volume 12, No. 3 of this Magazine. This year  we have done a similar survey of the Prince of Wales, and you might be interested to read this short account of the operation. The Prince of Wales was located on Sonar and marked with two mooring buoys prior to the start of the operation. The Far East Clearance Diving Team backed up by Clearance Divers from H.M.S. Sheraton, and the Royal Australian Navy's C.D.T. 1, carried out the survey, involving six days on task, between April 25th and May 6th 1966. Diving was initially carried out from H.M.S. Sheraton, but halfway through the operation, she had to be withdrawn for another task, and the team transferred to H.M.S. Barfoil for the remainder of the operation. A total of 64 dives were carried out between 160 and 180 feet involving an overall underwater time of 33 hours. Most of the dives were carried out in S.D.D.E., [Surface Demand Diving Equipment] but S.A.B.A. [Swimmer’s Air Breathing Apparatus] was used on a few occasions, particularly for the towed diver searches from the Gemini Dinghy. The weather was fine but the ocean current, although not strong, was unpredictable and at times hindered the operation by making the positioning of the diving support ship above the wreck difficult. The Prince of Wales lies on a heading of 020° and, bar about 50° or 20°, is completely capsized. The shallowest part of the ship is in the vicinity of her starboard bilge keel at a depth of 150 feet. The large flat expanse of the ship's bottom is remarkably free of marine growth and apart from the occasional sea egg, weed or small clam, is only covered with a fine layer of silt. However, the vertical surfaces and those in the dark under-hanging part of the ship are well covered with small clams, weed and similar encrustation. Owing to the vast size of this ship and the problems concerned with mooring the diving support ship above her, it was only possible, in the limited time available, to dive on three separate zones of the Prince of' Wales, namely, amidships in the vicinity of the engine room, right forward on the stem and the right aft in the vicinity of the propellers and rudders. (a) A large jagged hole about 20 feet in diameter in the forepeak passing right through the ship and in one place fracturing the stem post. (b) The starboard outer shaft crosses over the starboard inner and its propeller is wedged between the inner shaft and the hull. There is a jagged hole some 6 feet in diameter slightly forward of where the two shafts cross over. (c) The port outer propeller is missing entirely and the bare shaft has pulled away from the ship snapping the A-bracket in the process. A few feet forward of the A-bracket stub is a large hole about 12 feet in diameter with the shipside plating jaggedly bent inwards. Diving conditions were generally good, with at best a maximum horizontal visibility of 40 feet on the wreck, but this would reduce to some 15 feet when the ocean currents stirred up the silt. The wreck abounds with marine life and one was constantly accompanied by shoals of fish of all varieties. Apart from one very large and lethargic whale shark, no other kinds of shark were seen, but large shoals of barracuda were frequently in attendance and on a few occasions, large grouper or Jew fish were sighted. As one ascends away from the wreck and out of the then milky blanket that enshrouds this great ship in her rest, one comes into crystal clear water with visibility in excess of 120 feet. As you look down on this awesome sight, the full effect of the tragic saga becomes very near to one in the quiet of the underwater world.